The freezer is a godsend for those of us who doesn't have time to prepare a meal everyday or doesn't like to go to the grocery store often. The most common thing I freeze (apart from those already frozen from the store) are meats and herbs. Many people also cook large quantities of food and save some in the freezer (I don't have much experience doing that though). This is the first of a series regarding freezing stuff, and as the title suggests, it is about fish. I like freezing fish because when prepared properly, the texture and taste can be preserved for months. The first thing you must remember is to use fresh good quality fish. Freezing will always deteriorate the taste of fish, and good quality fish will undoubtedly taste better after a few weeks. 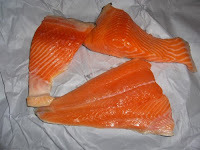 I always freeze fish in fillet form, as it will be easier to prepare after thawing. To prepare the fish for freezing, double wrap it in saran wrap (make it tight) or put it in a freezer bag (zip-lock bags are good). Make sure there's no air in the bag. Put it in the freezer and turn it to the coldest setting so that the fish will freeze faster. When thawing fish, never use hot water or leave it in room temperature. Bacteria starts to grow quickly in those conditions. Instead, put the fish in a zip-lock bag and run it under cold water. Freezing and thawing fish makes for long-lasting and great tasting fish (when done properly). Fatty fish such as salmon can last up to three months in the freezer, and leaner fish can last even longer. So the next time you see your favorite fish on sale, buy more and freeze it! I will continue this series in the coming days/weeks, so stay tuned. Very informative post. Thanks for the great tips.